Dark matter is a mysterious invisible substance that makes up about 85% of matter in the Universe. 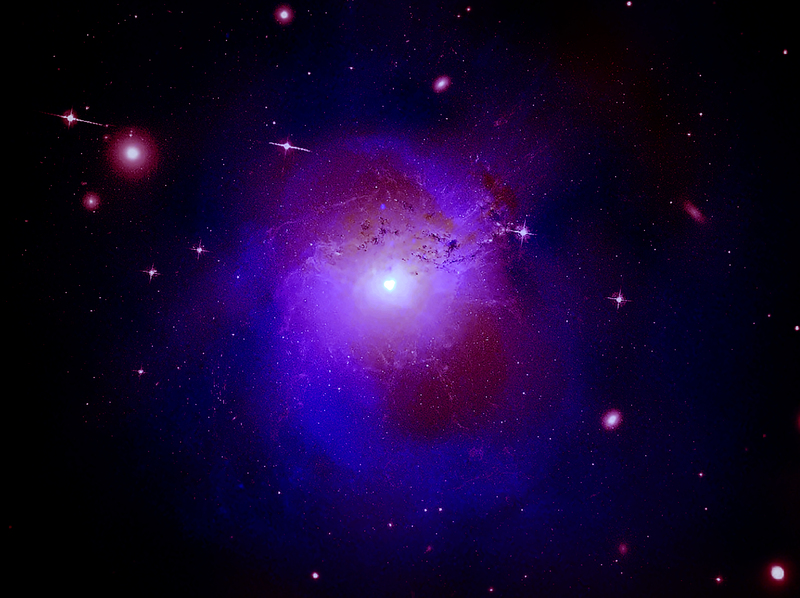 In 2014, astronomers reported the detection of an unusual emission line in X-ray light from the Perseus and other galaxy clusters. A new interpretation of this detection and follow up observations may provide an explanation of this signal. If confirmed with future observations, this result could help resolve the nature of dark matter. 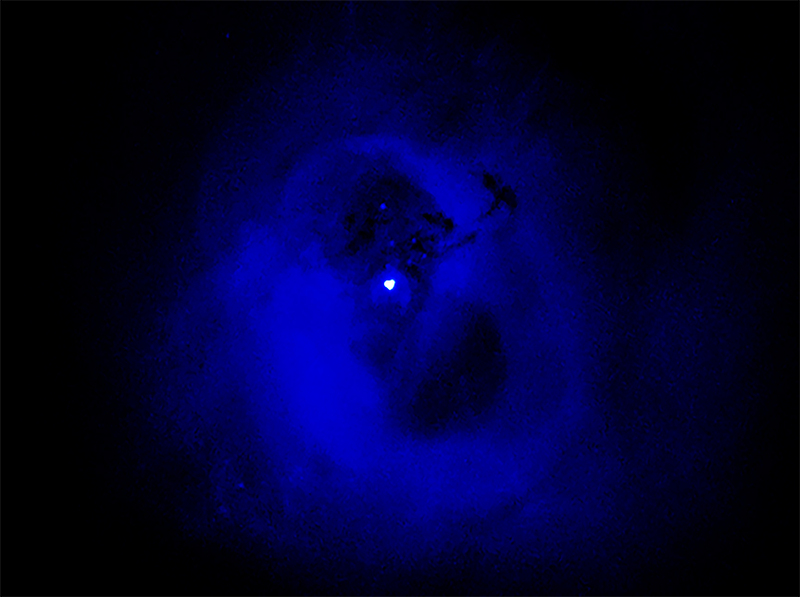 The image shown here contains X-ray data from Chandra (blue) of the Perseus galaxy cluster, which has been combined with optical data from the Hubble Space Telescope (pink) and radio emission from the Very Large Array (red). In 2014, researchers detected an unusual spike of intensity, known as an emission line, at a specific wavelength of X-rays (3.5 keV) in the hot gas within the central region of the Perseus cluster. They also reported the presence of this same emission line in a study of 73 other galaxy clusters. In the subsequent months and years, astronomers have tried to confirm the existence of this 3.5 keV line. They are eager to do so because it may give us important clues about the nature of dark matter. However, it has been debated in the astronomical community exactly what the original and follow-up observations have revealed. A new analysis of Chandra data by a team from Oxford University, however, is providing a fresh take on this debate. The latest work shows that absorption of X-rays at an energy of 3.5 keV is detected when observing the region surrounding the supermassive black hole at the center of Perseus. 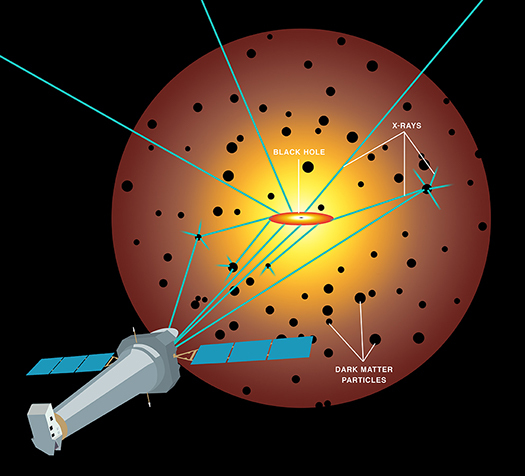 This suggests that dark matter particles in the cluster are both absorbing and emitting X-rays (see our artist's impression above for a diagram helping to explain this behavior, where 3.5 keV X-rays are shown). If the new model turns out to be correct, it could provide a path for scientists to one day identify the true nature of dark matter. For next steps, astronomers will need further observations of the Perseus cluster and others like it with current X-ray telescopes and those being planned for the next decade and beyond. A paper describing these results was published in Physical Review D on December 19, 2017 and a preprint is available online. The authors of the paper are Joseph Conlon, Francesca Day, Nicolas Jennings, Sven Krippendorf and Markus Rummel, all from Oxford University in the UK. NASA's Marshall Space Flight Center in Huntsville, Alabama, manages the Chandra program for NASA's Science Mission Directorate in Washington. The Smithsonian Astrophysical Observatory in Cambridge, Massachusetts, controls Chandra's science and flight operations. X-rays are blue. Optical is pink. Radio is red.